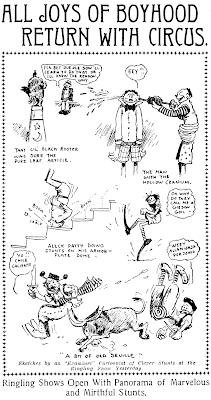 Tuesday, September 24 1907 -- Attendance at the Ringling circus was 16,000 and a fine time was had by all. Among the odder acts not pictured above was a horse that kicked a football. Didn't know a horse's legs moved in that fashion, but then I guess that's what made it noteworthy. 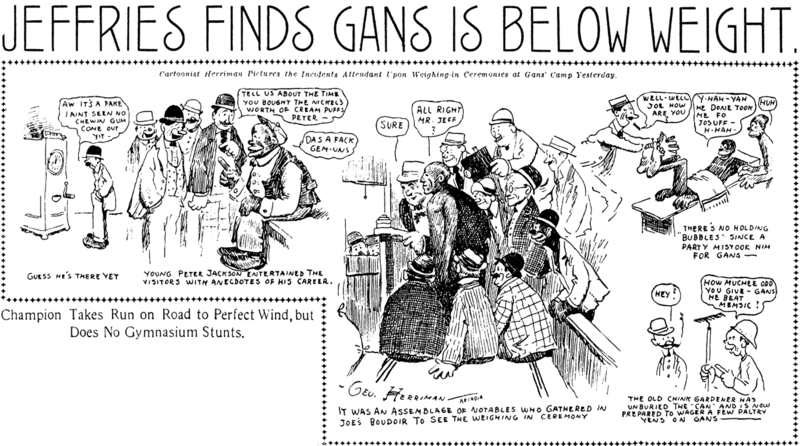 Wednesday, September 25 1907 -- Gans is just days away from his match with Memsic, and Jim Jeffries' entourage pays a visit to watch an early weigh-in. 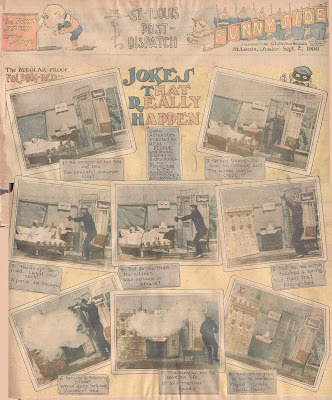 Some explanation of Herriman's vignettes above; at the far left the fellow trying to get gum out of a machine is having trouble because this was one of a whole roomful of gambling machines that had been set up at the training camp. Designed to extract some silver from visitors, the machines helped pay the boxer's expenses. Next to that we have Young Peter Jackson, a boxer of no special note if the Boxrec website tells the whole story. The original Peter Jackson, on the other hand, is considered one of the early greats. As we've probably mentioned before in these posts, boxers in that day often took on the names of former greats as a marketing gimmick. The reference to Bubbles on the upper right I can't explain further; undoubtedly the incident was explained in the accompanying article, but my photocopy only saved a small portion of it. Hello, Allan---I believe that back then, early slot machines got around the law by dispensing candy or gum, the reasoning being if you always got something for your money, it warn't gambling. Of course nobody cared about the terrible gum any more than we did when buying Topps baseball cards as kids. ---Cole J. The first American motion picture companies were established in the late 1890's. The film scenes shown in the Pulitzer Funny Side comic section in 1900 were produced by the American Biograph and Mutoscope Co., later to become the MGM of the nickelodeon era with the entrance of D.W.Griffith eight years later. It's name was later shortened to simply the American Biograph Co. Poor management choices (like firing Griffith) led to the company's demise in 1916. 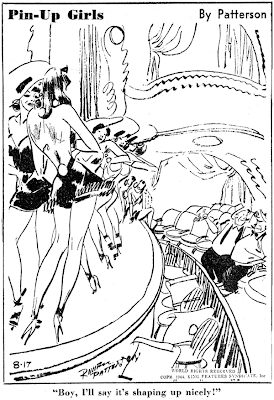 The films here were still intended to be seen in a mutoscope machine, as shown being watched by one of Paul West's Roly Poly characters in the masthead of the first episode. Projecting film upon a screen had yet to become the dominant film venue. How The Young Man Got Stuck at Ocean Beach (released May 1900): A cop uses glue to nab some serial "spooners" by shmutzing up a bench. Another Victorian trespass against having a little fun. A Farmer Who Could Not Let Go (released May 1900): Back then it was thought that mild jolts of electricity shooting through your body was good for your health. Small battery-run sets were sold for home use. One would hold two conductors wired to the battery as someone you trusted would control the dose given. This film shows a large fairground sized electricity machine. As in many, many cartoons of the era, the victim is given a blast so powerful, he gets paralyzed like a statue, prone for any larcenous mischief. I wonder though, wouldn't the thief become spontaneously frozen as well, the farmer's body acting a conduit for the juice? And how much did the electricity set-up cost to set up and run, just to abandon once they rolled a random hayseed? One really shouldn't waste too many brain beams on it, I guess. The Burglar-Proof Bed (released July 1900) A home invasion is thwarted when a Murphy bed turns into a stone fortress. A tiny cannon blows away the thug, and we get a salute from the goofy bed-owner and the American flag pops up! This guy's been waiting for this for years! All of these short films are quite similar to the comic strips of the era. Brief, mindless, cause-and-effect affairs with stereotypes and quick blasts of violence. 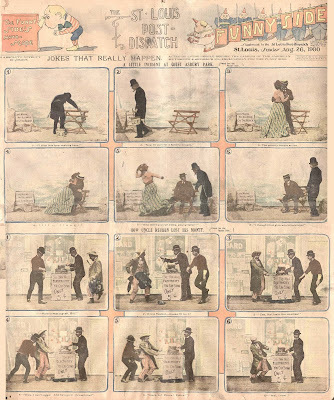 I'm a-wondering if these were the first instances of photos as a comic strip? I wonder the same thing, Cole. 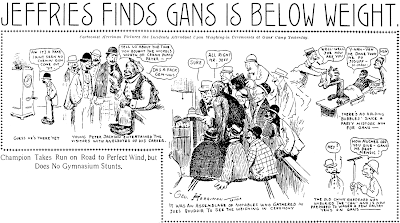 Are these truly the first fumettis, or photo-comics, to appear in American newspapers, or for that matter, published anywhere???? Since the other day I gave you some grief, I thought today I'd ask a favor. Every time I read about Barker and his index I immediately plan on getting the few (obscure?) Inks issues I don't have. Ohio State used to have a website where one could order those, but now I can't find it. Can anybody direct me? By the way, nice obscurity today. Gee, I had no idea they were available after the original publication dates. I'd love to fill out my run as well, missing several issues I think. The entire set for $25 + $10 shipping. Cheap! Hello, Allan---If an artist should need be assigned to JOKES THAT REALLY HAPPEN, then in the 9-2-00 episode, it was Paul West who did the lettering and the little burglar head at the upper right.---Cole Johnson. "we assume that the feature also ran in the New York World. We can't say that with absolute certainty since Ken Barker's World index does not include them,"
in fact, re "not being obscure enough", this is the first 'Obscurity of the day' that I've actually seen before. it's funny because I know you know more about this stuff than I do. The page stuck in my head for the same reason you remarked above. It's an interesting if isolated early example of 'fumetti' or photo-comics. When in Italy last month I asked somebody about the Italian photo-comics. I shouldn't have mixed this up with the chianti, but I seem to recall it was something to do with not being able to import the American comics just after the war, and also the state of the Italian film industry at the time. The fumetti business was big enough that actors could make small but worthwhile careers out of it. Anyway, using 'fumetti' in the instance of the NY World page would certainly be an anachronism. And if I've got it all wrong, somebody please correct me as I'd like to know. Most everything I wanted to say about this feature, and more, has already been said over on Don Markstein's Toonopedia, so I think I'll just take the easy way out and direct you over to that page for information on Desperate Desmond. I'll stick around only long enough to disagree with a few bookkeeping details; according to my info the strip started on March 11 1910, not March 10, and ended October 15 1912, not June 13. 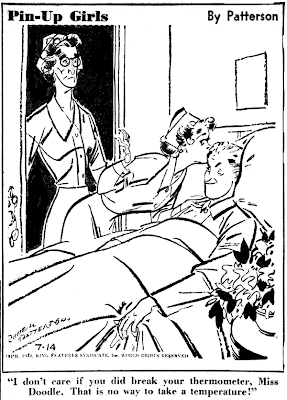 I also wondered if Desmond really did continue by that name in the Dauntless Durham strip, but since I'm unable at the moment to locate the reprint book of that strip I'll demur. As regards syndication of the strip, the Hearst company National News Association was in charge. Such a huge departure from Abie the Agent! Josh Lambert. “"Wait for the Next Pictures": Intertextuality and Cliffhanger Continuity in Early Cinema and Comic Strips.” Cinema Journal 48, no. 2 (2008): 3-25. Thanks for the offer, but when I see words like "intertextuality" in the title of an article I know I have no desire to go further. I'm allergic to academese. I'm going to have to call you on this one Allan. If you direct me to a Toonopedia page or, say, page 202 of Horn's Encyclopedia then I think you're extending the meaning of 'obscurity' a bit too much. Though the idea of creating another titled posting about correcting mistakes in the books sounds intriguing. Cut me some slack, buddy! 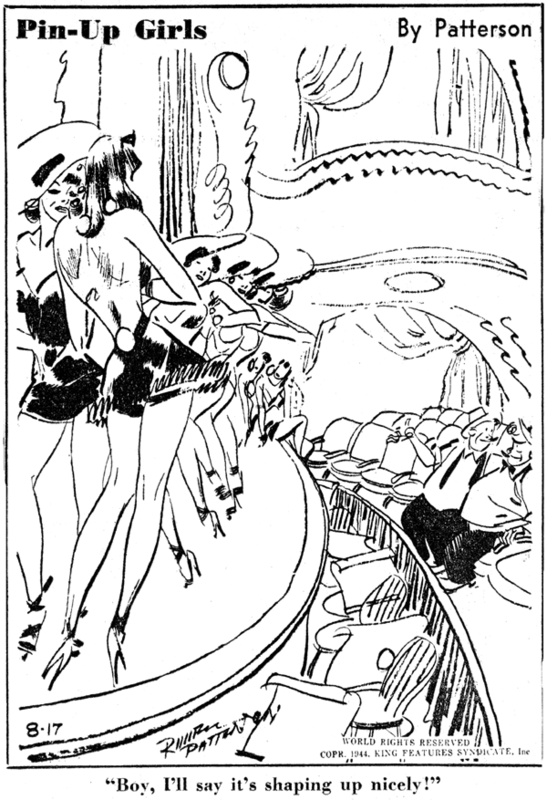 Strip ran for two years 99 years ago and it doesn't qualify as an obscurity? You are a stern taskmaster. Actually I just really wanted to share those two great samples, obscurity or not. The uber-classic buzz-saw strip and the way cool strip set at Coney Island. That's a heck of a lot better than those blurry single panels you got over at Toonopedia or in Horn's book wasn't it? Hello, Allan----I suppose that since the 1970's, with the Hyperion collections and the World Encyclopedia of Comics, many strips that were actual obscurities are now better-known than they were back in their day. 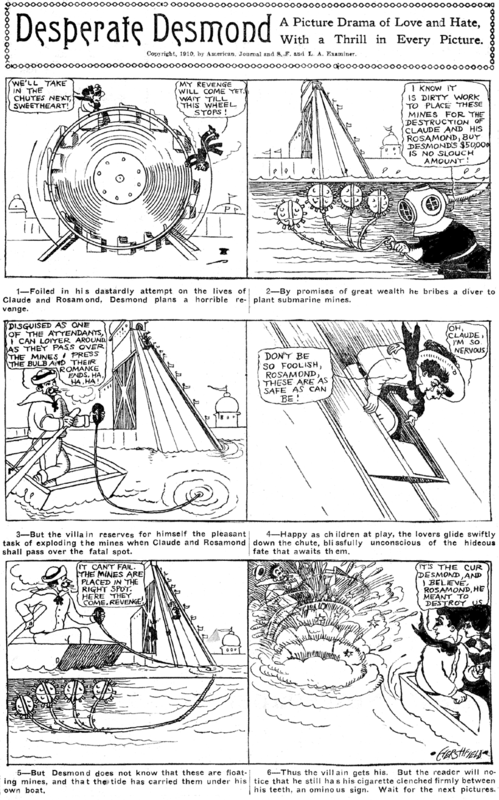 One of the most obscure oddities ever were the 1906 Feininger strips for the Chicago Tribune. It was hardly a success, but today they're considered a towering achievement of the art form. ("Success" doesn't always mean good. Some strips that nobody today could possibly care about, i.e. THE OLD HOME TOWN, MR. AND MRS., FRECKLES, etc. went on for yearsnyearsnyears.) -------Intertextually yours, Cole Johnson. In an era when millions of young men were forced by world events to leave home, the country came together not only to fight the war but also to keep up the morale of these newly minted soldiers. During the war years pin-up girls, previously considered just a bit sordid, were embraced as patriotic. 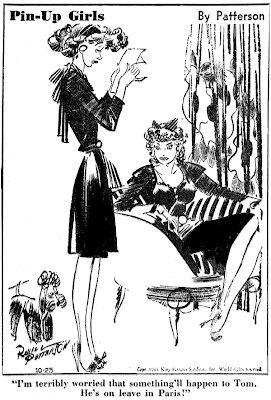 Hollywood churned out actress pin-up photos by the millions, and even the newspaper comics got into the act. 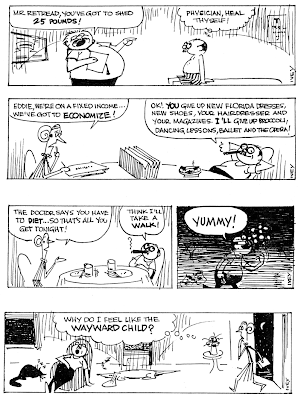 Russell Patterson had a great career going in illustration, and he took this opportunity to do his first open-ended newspaper series (at least for a US newspaper -- early in his career he reportedly did a french language strip in Canada). Patterson had previously confined his newspaper work to closed-end series for Sunday magazine covers, a sample of which can be found here. 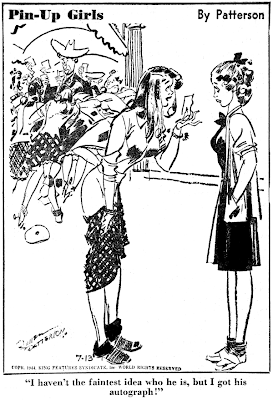 Patterson's Pin-Up Girls, a daily and Sunday panel series distributed by King Features, arrived close on the heels to another essentially identical series from the same syndicate, Cuties by E. Simms Campbell. Campbell's feature debuted in 1940, and Patterson's began sometime in January 1942 (exact begin and end dates unknown, can anyone help?). Campbell's series was proving quite popular, but Patterson's did not catch on. 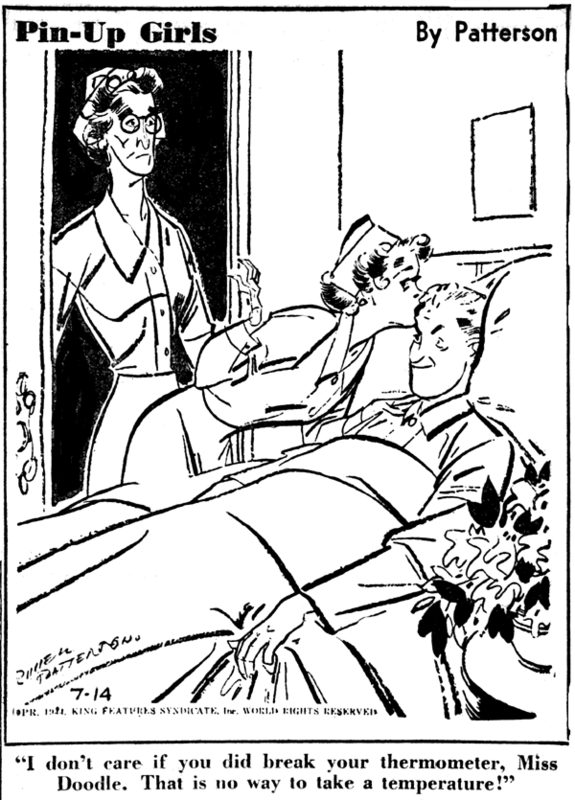 Whereas Campbell seemed to have hit just the right note with his babes, Patterson's cartoons seemed just a bit old-fashioned. 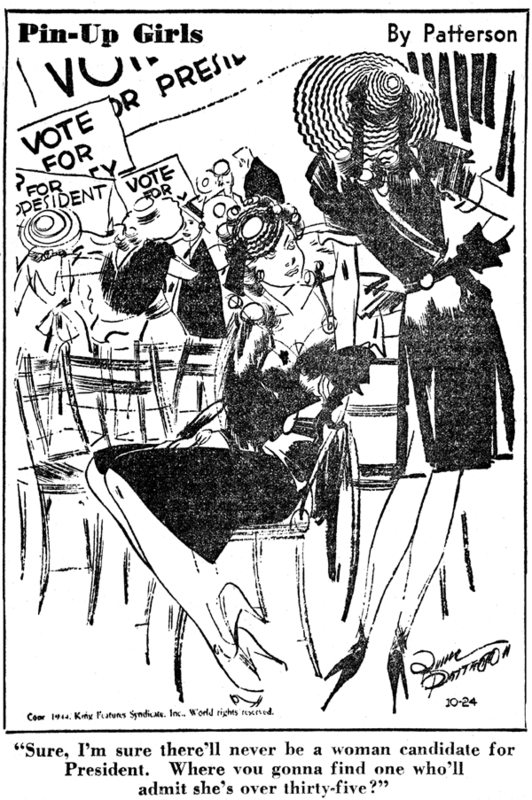 His sophisticated drawing technique emphasized style over cheesecake, and newspaper editors wisely preferred the Campbell version. Campbell's girls, beautiful as they were, seemed like they might just be within reach of fantasizing GIs, while Patterson's were vaguely haughty and out of their league. Pin-Up Girls continued through the war in a small list of papers, ending sometime in March 1946. The Sunday version was discontinued earlier but I don't know when. Pay particular attention to the top sample above. Can anyone explain to me how in the world that cartoon made it into the papers? Sure looks to me like that girl got a whole lot more than an autograph from the mystery star! Hi all. 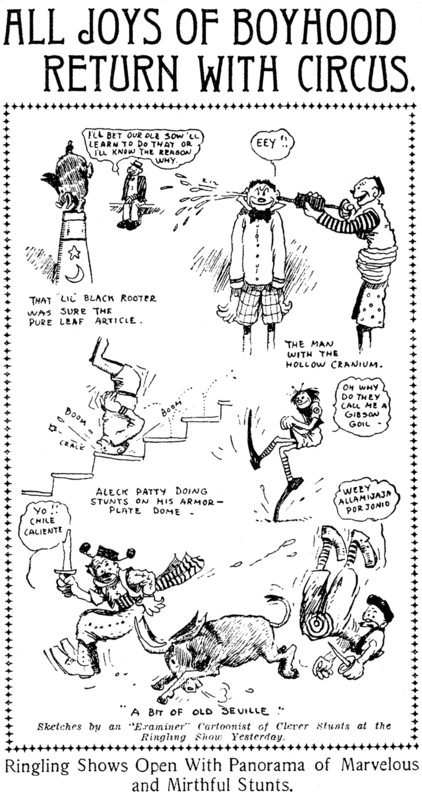 Frightfully busy today, so here's a quickie -- a great Mutt and Jeff strip from 1912. Bud Fisher was one of the earliest cartoonists to regularly 'break the fourth wall', and here's a delightful example. 97-year old joke, and it still works!